Getting regular eye health care is not just for people with sore eyes or a red eye problem, it is for everyone. 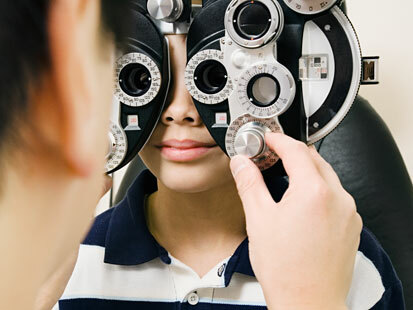 Seeing an eye doctor regularly means that diseases like macular degeneration, glaucoma, and retinal tears can be found at an earlier, more treatable stage. What does an eye doctor do during an exam? First, he or she will talk about health and eye problems, medications, and allergies. It’s important to discuss all these things, because some diseases like diabetes, multiple sclerosis, and lupus can all affect the eyes. Some medications, such as amiodarone, Thorazine, and tamoxifen can cause changes that need to be monitored. Next, the doctor will do a thorough exam of the eyes and vision and determine the vision prescription for glasses or contact lenses if appropriate. The doctor looks at not only the eyes themselves, but also the eyelids, lashes, muscle movements, eye pressure, how well the eyes work together as a team, and color vision. She or he will examine the front of the eye for any scars or dryness, look for cloudiness in the lens (a sign of cataracts), and check the fluid inside the eye for floaters. The doctor will often dilate the pupils to get a better look at the retina, the tissue that lines the inside of the back of the eye, as well as the optic nerve. This makes it easier to find tears or holes that could cause a retinal detachment, or the leaky blood vessels that are the hallmark of diabetic retinopathy. Once the eye examination is done, the doctor will go over the results. If conditions like glaucoma, macular degeneration, or diabetic retinopathy are found, the patient may have to return for other testing, such as retinal photography or a visual field test to check the side vision more thoroughly. Many conditions can be successfully treated with appropriate eye drops, laser procedures, or surgeries. Some diseases can be slowed down with proper care. Those who have not had an eye examination in over two years should call their eye clinic to schedule a routine eye health exam. People with health problems like diabetes or multiple sclerosis or specific eye diseases like glaucoma or macular degeneration will need to see the eye doctor at least yearly and sometimes more often. After watching this video, you will know what to expect at an eye exam!